Stars of Valor was finished at the Sister's Sewing Retreat at Marilyn's house in April. 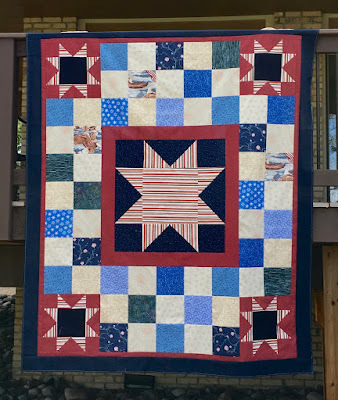 I used scraps from other Quilts of Valor but didn't count correctly and had to beg some fabric for the centers of the small stars from Marilyn. 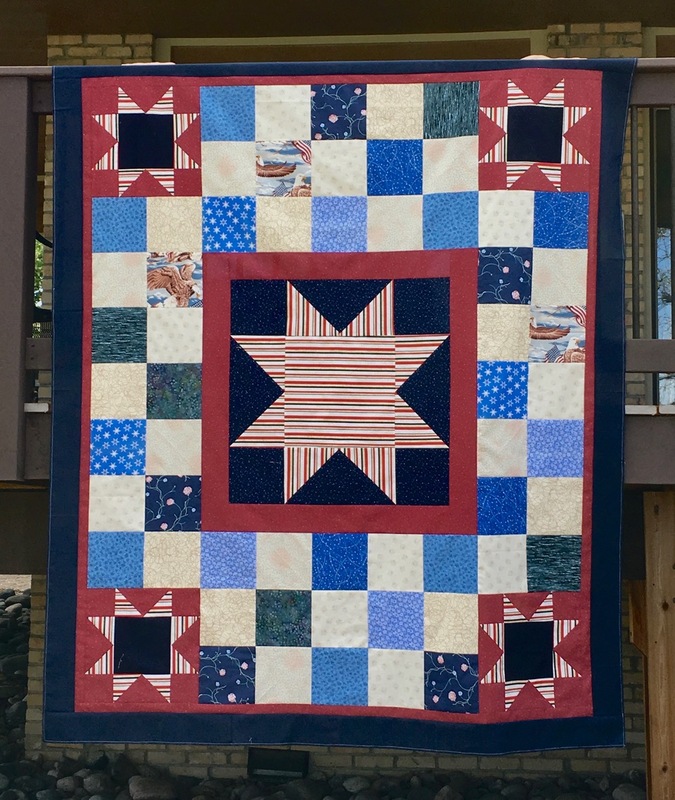 Stars of Valor is #113 in the Quilt of Valor tally. It turned out great. 113 is an amazing number. Wow! Our guild has collected approximately 100 blocks (8") so far and hope to get a few more so we can do 2 QOV quilts. The local Women of the Moose are going to partner with us and pay for batting and backing. Wonderful as always! It's a beautiful quilt. Very, very pretty. I particularly like the center star. And 113 is so impressive!!! 113? You are amazing! I love this quilt. It reminds me of America--a contrast of dark and light, and the stars win in the end!! I love your quilts of valour. Do you quilt them yourself after machine piecing or do you get someone to do that for you? Luckily, quilters and knitters usually have plenty of "stash" to share. The quilt turned out lovely, as usual. You are a talented quilter! I have made 1 quilt for the Valor charity; good for you and your group to make so many and this one is a beauty! Wonderful. I'm all for "borrowing" fabric from friends.